Intertops Casino has just started another massive casino bonus giveaway. During its On the Top promotion they'll award $120,000, some to reward frequent players and some just randomly awarded so everyone can win. Every week until November 2nd, 300 players will share $30,000 in casino bonuses. If you're in the top 20 any of those weeks you'll be entered in a final draw for a $1000 cash prize. 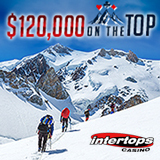 Intertops Casino offers hundreds of casino games from RTG (Realtime Gaming) as well as poker and sports betting.